Time for a new vehicle? Have you considered getting a hatchback? Hatchbacks give you the best of both worlds, they get the same great fuel economy and ride the same and a sedan but also have extra cargo space. A popular hatch option from Volkswagen is the 2019 Golf GTI. 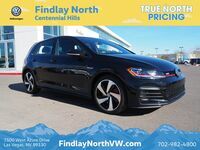 The 2019 Golf GTI has the sleek style that you want while also packing enough power under the hood (228 horsepower) to make driving fun again. The impressive fuel economy of 24 city and 32 highway mpg can be found throughout all four trim options – S, Rabbit Edition, SE and Autobahn. Keep reading to learn more of what the 2019 Volkswagen Golf GTI has to offer or click on the button below to view our current Golf GTI inventory! The 2019 Golf GTI has the look and power that you want, but what about its features? There is no shortage of technology inside this hatchback. The available 8-inch touchscreen display allows drivers to access their apps, music, navigation system and much more. Speaking of music, the available Fender® Premium Audio System packs 400 watts of power so that you can enjoy clear sound through the eight speakers inside the Golf GTI. Volkswagen knows that not everyone is perfect and that drivers can always use an extra set of eyes while they are on the ride. The available Driver Assistance features help to give drivers the confidence they want on the road. These available features include Adaptive Cruise Control (ACC), Blind Spot Monitor, Light Assist, Lane Assist, Park Assist, Park Distance Control with Maneuver Braking, Front Assist and Rear Traffic Alert. These features are just the beginning of what the 2019 Volkswagen Golf GTI has to offer. If you are interested in learning more about this VW model, click on the button below to receive more information! Interested in a 2019 Volkswagen Golf GTI?